One of the most exciting comedy performers and hailed by both the national press and public alike, Jason Byrne is the ‘must see’ comedian for the new Millennium. Jason’s inspired, original brand of high-energy lunacy ensures that there is no other comedian presently like him. His fast, free-wheeling style, fused with an array of offbeat props, makes his act a helter-skelter of a show – where the audience are promised the ride of their lives. He has been one of the fastest selling performers at the last 11 Edinburgh Fringe Festivals, where his sell out shows have attracted Best Headliner Chortle Award in 2007, a nomination for 1998 Perrier Newcomer Award, and then a much revered Perrier Award Nomination for his outstanding 2001 show. He was also winner for the 2004 Forth One Fringe Award and continues to play to packed houses through Ireland & the UK. At the 2009 Edinburgh Fringe Festival, Jason became the top selling comic ever in the history of the Festival. 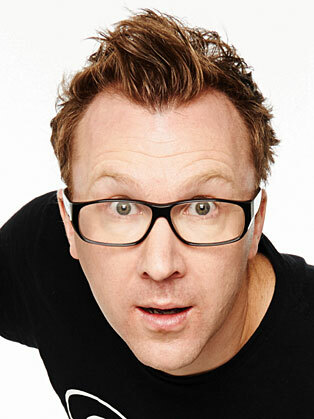 As well as his debut live DVD Jason Byrne – Out Of The Box (filmed in late 2006 in Vicar Street to a sell out crowd), Jason is about to begin recording the fourth series of his hit television series Anonymous(RTE2). Other credits included RTE Class Clowns, The Jason Byrne Show, Elvis Has Left The Building (BBC NI), Out On A Limb (BBC3), Jason Byrne is A Twiggy No Branch (Channel 4), Dark Ages (ITV), Stuck In The Middle (BBC), Father Ted(Channel 4), Stop The World (BBC) and Lenny Henry in Pieces (main writer, BBC). He has also appeared in several films including Alice in Wonderland (alongside Whoopi Goldberg, Martin Short and Gene Wilder). If ever a show deserved more than 5 stars it is this one. Not only is it the funniest show on the Fringe, it’s the funniest show I’ve ever seen. (Radio Forth One, Scotland).